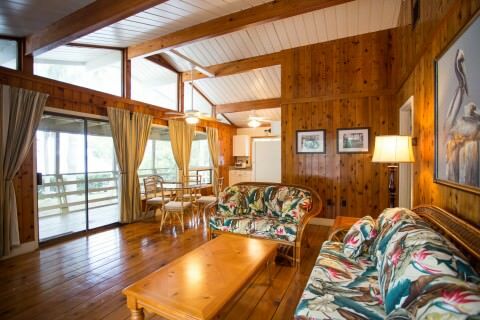 Cabbage Patch Cottage is an “old time favorite” often requested in advance by our repeat guests. The Cabbage Patch, which was completely remodeled in January, 2011, is a Cedar walled two bedroom, two bathroom air conditioned cottage with a king bed and a queen bed, basic TV, fully equipped and furnished kitchen located on the water with a private dock, screened front porch and a wrap around porch facing a gorgeous view of the Pine Island Sound. My family and I spent a week at the Cabbage Key Inn in the Tarpon and Cabbage Patch cottages to celebrate my Dad’s retirement and birthday. My Dad and his family used to spend their vacations down there as a child, which is what brought us back to his old stomping grounds. It was amazing to hear how little had changed, however it still had all of the modern amenities that we could want! The staff is amazing- everyone is incredibly friendly and laid back. We had a blast meeting everyone and spending a week with them. Katie C was amazing- always trust her menu recommendations! She never steered us wrong and is good people. The food is wonderful- fresh caught fish every day prepared in a different fashion every night. The cocktails are awesome- maybe a little too good haha. But wash it down with one of their amazing cheeseburgers and you have an equation for a perfect day! The island is fun as there are always people coming and going from the restaurant and bar, but at night it quiets down and is magical with the relaxation that just innately washes over the place. It really is a tropical paradise. Thanks for a great stay! After visiting Cabbage Key a number of times over the years for lunch and always saying, “I’d really like to stay here sometime” my wife and finally did this November for our 10 year wedding anniversary. 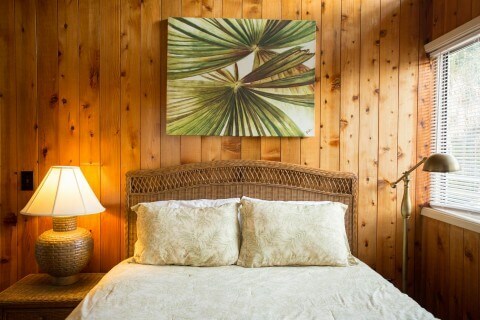 Cabbage Key did not disappoint … We stayed in the Cabbage Patch Cottage which was large, clean, fully equipped and in a good location. It was more space than the two of us needed. Because it has a full kitchen with all the supplies you need we brought a lot of food and made our own breakfast and lunch. They also provide a full size coffee maker. The cottage has it’s own dock which was great for parking our boat … Cabbage Key is an excellent place to stay for fishing. You’re in a prime location with great access to some of the best fishing in the state and if you hire a guide they’ll pick you up at the dock. We stayed at Cabbage Key this past weekend. It was our 4th stay but the first in the summer. We have stayed both in the Inn rooms and also in two different cottages-the Brown Cottage and the Cabbage Patch Cottage. 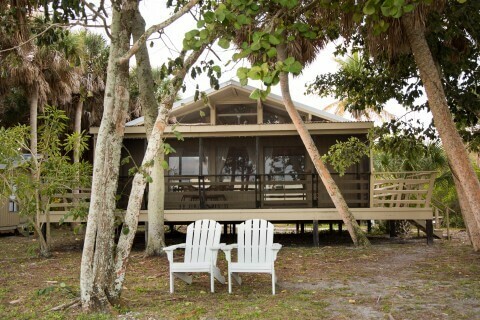 I would recommend Cabbage Key to anyone looking for a peaceful get away without any frills. We take our boat down there and spend the days visiting the surrounding islands (while Cabbage Key gets inundated with a lunch crowd for their famous cheeseburgers). We enjoy evenings back at Cabbage with a wonderful dinner and drinks at the bar. We love mornings on Cabbage for the blueberry pancakes if nothing else! Eating breakfast while looking over the calm water can’t be beat.